These Polish dessert recipes are typical of the types of meal-enders Poles serve for the Christmas holidays when friends and family come to visit. My Polish family started baking for Christmas around St. Nicholas Day, Dec. 6. The tasty treats we made were so full of butter and sugar, they theoretically could last until the Feast of the Three Kings on Jan. 6. But we and our company gobbled them up so quickly, we invariably had to make more after Christmas to see us through Twelfth Night. You'll find Polish Christmas Cookie Recipes here. Poppy seeds are a favorite in Poland with white poppy seeds being the most sought after. But they are hard to come by so bakers have come to use blue poppy seeds (what we know as black) with good results. This sweet yeast dough poppy seed roll -- makowiec -- could actually be classified as a poppy seed strudel. 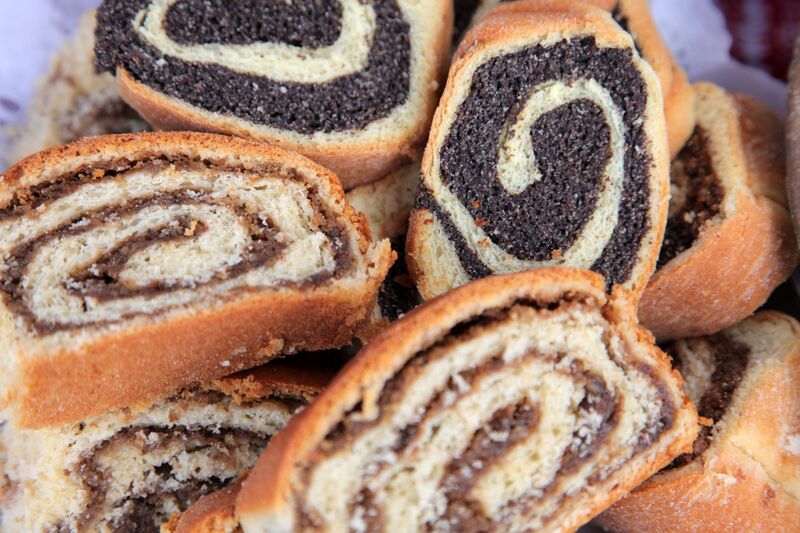 It is eaten year-round, but especially for Christmas and New Year's because Poles believe poppy seeds bring good luck. Canned poppy seed filling works well in this recipe unless you want to grind your own! Almonds are plentiful in Poland and they find their way into both sweet and savory foods. Here they are used in the almond roll -- strucla z migdalowa -- literally "strudel with almond filling." Canned almond filling (not paste) works well unless you want to make your own! What could be more appropriate for Christmas than angel wings? These Polish crullers -- chruściki -- are delicate, fried bowtie knots. They are eaten at many feasts and holiday events including Easter and weddings. This is one dessert that doesn't keep especially well -- a day or so at the most. But, wow, are they worth the effort! Gingerbread -- piernik -- baking in Poland started in the Middle Ages, as soon as the crusaders came back with their cache of spices. Gingerbread-baking guilds sprung up throughout Europe with strict guidelines as to who could make it, how it should be made, etc. Torun, Poland, the birthplace of Copernicus, is the home of excellent piernik and has a museum with antique gingerbread molds that is a must-see on any trip to Poland. This is one fruitcake that won't become a white elephant gift for your next Secret Santa exchange. Cwibak or chleb wigilijny, which literally means "Christmas Eve bread," has a moist, light crumb and is great for gift-giving. See these other ideas for edible gifts. Who doesn't love cheesecake? Poles make it many ways -- fluffy, dense, gelatin-topped, New-York style and more. This recipe for sernik has a custard-y texture and holds well for two weeks refrigerated. Just make sure it's covered. If you want to upscale this dessert, add warm apples and cinnamon ice cream, or any fruit and whipped cream. But, if you ask me, that's just gilding the lily. Not the prettiest kid on the block, dried fruit compote -- kompot -- packs a wallop of flavor. It's traditionally made with 12 different reconstituted dried fruits to represent the 12 Apostles. The longer the compote sits, the better it gets. This is another great edible gift, but it must be refrigerated. Compote is the most typical dessert served for wigilia or Christmas Eve supper. In my family, the compote was made of prunes only. Despite its reputation for having "medicinal" qualities, stewed prunes are delicious. Of course, they went down better with a few Polish Christmas cookies. Jan. 6 is Twelfth Night or Feast of the Three Kings (also known as the Epiphany) and is considered the official end of Christmas celebrations. Decorations are put away and everyone enjoys King Cake or ciasto trzech kroli. The person to get the coin or almond baked (or placed inside after the cake is baked) is king or queen for the day and will have a year of good luck. Traditionally served for Easter but made year-round, this flat, flaky pastry is set off by dollops of fruit filling or jam. A traditional mazurek should be no higher than about 1 inch. This particular mazurek (there are many varieties -- some filled, some with streusel topping, some plain) is called royal because the lattice-top filled with alternating flavors of fruit filling looks like the jewels in a crown. Since the fruit filling is added after the mazurek is baked, jam can be used.